(NaturalNews) Over the last several years, many who value health are becoming aware of the dangers of gluten, especially when it's consumed as modern wheat. 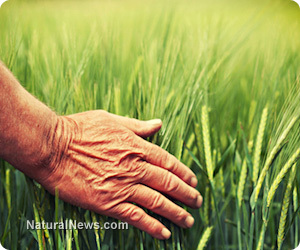 Severe digestive distress, celiac disease, rheumatoid arthritis, ADHD, multiple sclerosis and even mental illnesses such as schizophrenia are just a few of the maladies linked to the protein in wheat, barley and rye. As reactions continue to escalate at a staggering rate in the United States, both researchers and private organizations are beginning to take a look at ancient cereal grains as a possible solution to our wheat troubles. Commonly known as einkorn, Triticum monococcum is an intriguing heritage grain that was harvested as early as 16,000 BCE. Cultivation began during the Neolithic Era and early Bronze Age (10,000-4,000 BCE) and continued into the early 20th century, when much of einkorn production was replaced by hybridized, high-yield, pest-resistant strains of what we now recognize as modern wheat. Einkorn is nutritionally superior to hard red wheat, supplying higher levels of protein, fat, phosphorous, potassium, pyridoxine and beta-carotene. It's also much lower in problematic gluten. Enthusiasts of einkorn believe it tastes better, lending a "light rich taste which left common bread wheat products tasteless and insipid by comparison," according to the ASHS publication Progress in New Crops. What's really garnering attention, however, is that einkorn may be nontoxic to individuals suffering from gluten intolerance.